Doing healing work for others always brings you so much joy. You just love seeing the power of your work helping others. But running a healing business is not as fun or as easy as you hoped it would be. Clients aren’t coming in as quickly as you’d like, even though you posts on social media several times a day. You find yourself spending more time in the business side of your business trying to get clients, but your heart longs to spend more time on the healing side and working with your clients. Building a healing based business doesn’t have to be hard. And it doesn’t have to take away from doing what you LOVE — healing others. What’s really missing is an aligned marketing funnel that builds your clientele with ease. Imagine automatically generating list full of soul aligned clients who can’t wait to work with you! During the last few years, I have built my own 6 figure business. After quitting my branding and marketing job at Nestle where I launched multimillion dollar products including a $54 million dollar product that won Product of the Year, I dove head first into my spiritual practice through yoga teacher trainings, sacred soul alignments, manifestation courses as well as online marketing to building my business. To be honest, the first few years wasn’t pretty and it was a lot of hustling. It wasn’t until I figured out how to properly create funnels and build my brand did I finally start to see momentum in my business. After building a business on my branding and marketing expertise and creating my 6 figure business, I’ve felt called to create share my knowledge with spiritual healers, combining my love for branding and marketing with spirituality. It’s a spiritual full circle so to speak. In Spiritually AF, I have taken some of my best branding, marketing, and funnel techniques I teach my high end clients and created an easy to follow, step-by-step funnel system, for spiritual healers. In 6 weeks, you’ll learn how to build a grounded foundation for your spiritual healing business and create an aligned marketing funnel that automatically brings in sales and new soulmate clients with ease because they see your brilliance. This new program will be a BETA program, which means you’ll be getting my full program at a deeply discounted investment, which is already a fraction of what I charge my high end clients and for my high end programs. Learn how to identify and find your soul aligned clients who see your brilliance, value what you do, and buy from you immediately. Position yourself in the market as an expert go-to healer in your industry by learning how to craft messaging that speaks to the hearts of your soulmate clients and stands out from your competitors. Develop your “Brilliance Ladder” where you will be able to stack your offers so they don’t just buy one product, but multiple products at one time. Create your aligned marketing funnel with ease so it’s setup in a way that your soulmate clients feel your value, fall in love with your brilliance, and become automatic YESES to buy your products or services. Learn the secret to running successful FB ad campaigns that automatically fill your funnel with buyers (and also have your funnel pay for your ad costs, and then some). WE ARE ONLY TAKING 10 BETA TESTERS FOR THIS ROUND! The normal investment will be $997 when we launch the program. As beta testers, you’ll receive 50% off (one time payment $497 or 2 payments of $297). Once you complete the course, launch your funnel, and provide a testimonial, all within the 6 weeks, I will also be refunding you $100 as a thank you so the investment level will only end up being $397 or ($494 if you do the payment plan). We aren’t looking for everyone to join this round. You must be 100% committed to completing the work every week. You must be ready to build and launch your aligned marketing funnel within 6 weeks. You must be willing to invest in FB ads and the systems needed to run the funnel (we will be sharing which systems we recommend and how to reduce your FB ad costs). You must be willing to be engaged in the community (e.g. in FB group) we create with comments / questions. Basically, you show up in the community to help each other grow. You must be willing to provide a video and written testimonial within the 6 week time period. 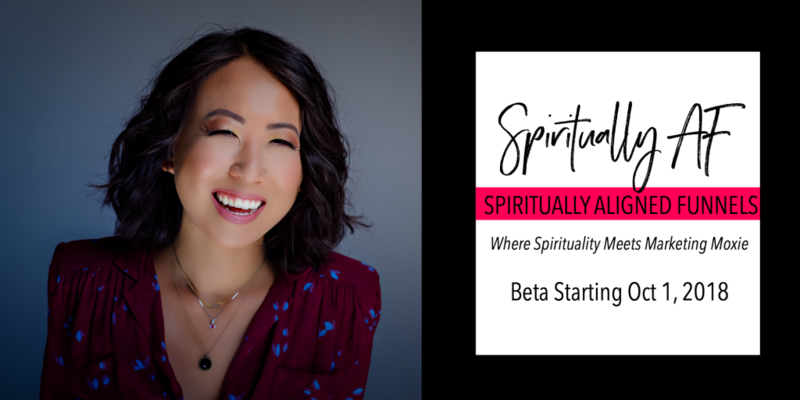 If you feel called or know in your heart this is absolutely the right next step for your business so that you can make an even greater impact with your healing work, sign up below with the special beta pricing. We officially starts Oct 1, 2018.